Everyone can get into an unexpected emergency situation. In outdoor activities like camping, hunting, climbing and fishing, or even while walking lengthy distances in the countryside or wilderness, it is always best to be ready. With this 6 in 1 Essential Survival Kit, you will always be completely safe. 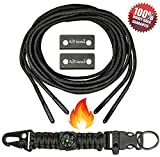 With the survival kit featuring the paracord compass key chain, emergency whistle & D-shape carabiner, also the 2 Shoelaces having embedded fire starters & 2 pcs serrated edges fire scrapper, you'll be able to wear the tools that can keep you secure & warm in the wild in case things get tough out there. While wearing A2S Essential survival kit boot laces can be ensured that you are always prepared in any emergency situation. The survival kit is made of top quality, parachute cord that can easily lift a person or item. One of the essentials needed to survive a night in the wild is a fire and with the included magnesium flint rod and sharp, stainless steel, fire striker, that doubles as an emergency knife, you will be able to start one without much effort to boil some water, cook some food, and stay warm. You can use the carabiner to secure your essential items while you can leverage the emergency whistle to transmit audio signals to indicate your position to rescuers. Finally, when you're ready to make your way back home, the big, easy to view compass will come in handy to ensure you don't get further lost in the wild. 6-IN-1 EDC EMERGENCY KIT. Box Contents: (2X) 7 Strand Parachute Cord SHOE LACES - features: (4X) Ferro Rod Flint Fire Starter, (2X) serrated edges Fire Scrapper (can be used as Emergency Knife). Paracord Key Chain - features: High Quality Compass, Emergency Preparedness Whistle. Hiking gear D-shape carabiner, 7 Strand Parachute Cord with fire tinder. Extra 8 inch paracord rope with tinder for instant usage. Printed leaflet containing instructions manual, survival tips & useful information. SHOELACES FIRE STARTER: When the need of lighting a fire is a matter of life or death those are the shoelaces you need to have on your hiking boots. | LIGHTWEIGHT & IMPROVED BUSHCRAFT DESIGN - Easy access Magnesia Rods secured firmly to metal base for better grip function when you start a fire. Makes the A2S Essential Survival Kit an indispensable survival accessory for any urban & outdoor activity. Ideal for unexpected survival situations. TESTED FOR EXCELLENCE: Has been tried & tested to a minimum breaking point of 550lbs/250kg. Deploy your PARACORD Key holder rope in any situation where an extremely strong rope or cordage is needed. Use one of the Seven Inner Strands as Fire Tinder, Fishing Line or Sewing String.